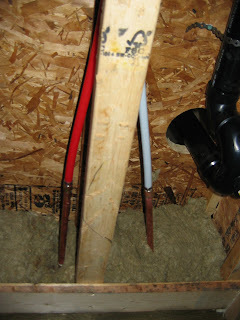 Cottage on the Edge - the DIY Cottage Blog: 4 Reasons Why PEX is a DIY Plumber's Dream! 4 Reasons Why PEX is a DIY Plumber's Dream! I just love PEX! PEX is truly a DIY plumber's dream! IN the picture you can see all the plumbing to the upstairs shower. In addition to the drain you can see the hot and cold water supply. Can you guest which is the hot water supply? At least inexpensive with respect to copper plumbing. I have estimated that the PEX is roughly one quarter the price of a system built with copper. Just drill the holes in your joists, if required, thread the PEX pipe from the entry point to the appliance and your done. Be sure to follow the building code requirements for placement of holes in any joists. Because you can bend the PEX you can create one complete length with no joints, elbows, etc. This save a lot of work, plus eliminated the nasty effort of soldering copper in tight spots. The PEX system makes it easier to build a manifold-based system which eliminates the nasty competition for hot or cold water among two or more applications. No more scolding shower surprises when someone else turns on a faucet.